-Constructed with indestructible "Zero Chain Drag" plastic. Delivers smooth performance and consistent chain tension. -Open design disperses sand and dirt through the bottom. All necessary hardware is included. -1-year pro-rated warranty through the manufacturer. -Replace that old stock roller with a new slider. 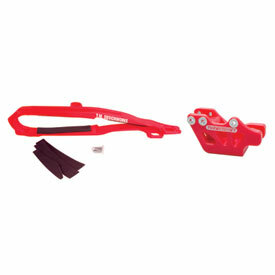 Reduces chain slap, keeps the chain in line under power and off jumps. This will in turn improve rear wheel HP and suspension performance. -Only works with stock swingarms. Perfect fit! Looks great!! Has a quiet sound compared to the stock parts, I would always hear a little metal clank sound with the original! Not anymore!! Fitment was perfect. Easy to install, a nice upgrade from stock. So far only have one ride with it. Looks good and fit perfectly. We will see how it holds up. Gave it 4 stars for durability because it is too early to tell. Great product looks and works perfect. Don’t waste your time and money on anything else! 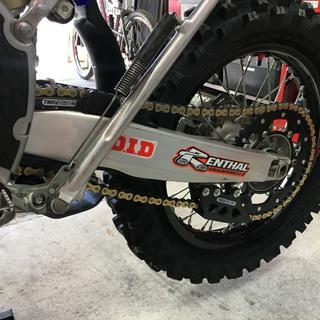 Do it once, do it right and only use T.M designs chain guides! I highly recommend this product. The T.M designs chain guides are well made and look super trick. I purchased an aftermarket set that showed excessive wear after one ride. This forced me to investigate a better solution and T.M designs was it by a long shot. The fit on my 2017 yz450fx was perfect and chain noise is greatly reduced. I have done one ride since fitting and you can barely tell it has been used. I will not buy anything else but this product. The price might be slightly high and obviously still a consumable part but well worth the investment you will not be disappointed. Fits as it should, the factory guide is definitely better quality, wouldn't purchase again. Low grade mounting bolts, I was able to snap them with a 1/4 drive ratchet. LOUD ,LOUD ,while riding. The logo on the front chain glide is a cheap decal.. 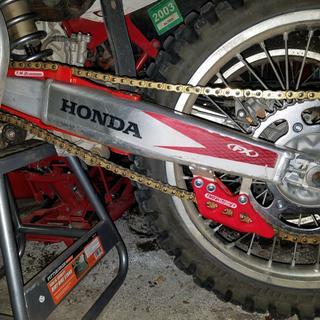 This TM designs chain guide and slider for my 450 X Honda fits perfect and eliminated the annoying excessive Chain slap. A little spendy but worth it. Fit well and functions well. Needed to do some fab work to for the stock chain guard to fit. I always upgrade my stock chain sliders to these when they wear out. These hold up longer and will probably outlast your bike in longevity. Very well made and precise fitment especially if you run enduros. Adds a touch of color and wears like iron. Add some silicone adhesive under frame slider to lesson the noise. This is a lot better than the stock chain slider. A lot more durable and looks good. are expensive, but after installing the the rear tire rotates easier, less friction more power! Does not have the noise or melting problems as some other brands have. After four rides in the same conditions that chewed up an OEM slide and guide in two, there is no noticeable wear. What is the difference between this and the Gp MX Slide and Glide Kit ?